Miss Singh: SIX MUST WATCH TV SHOWS! 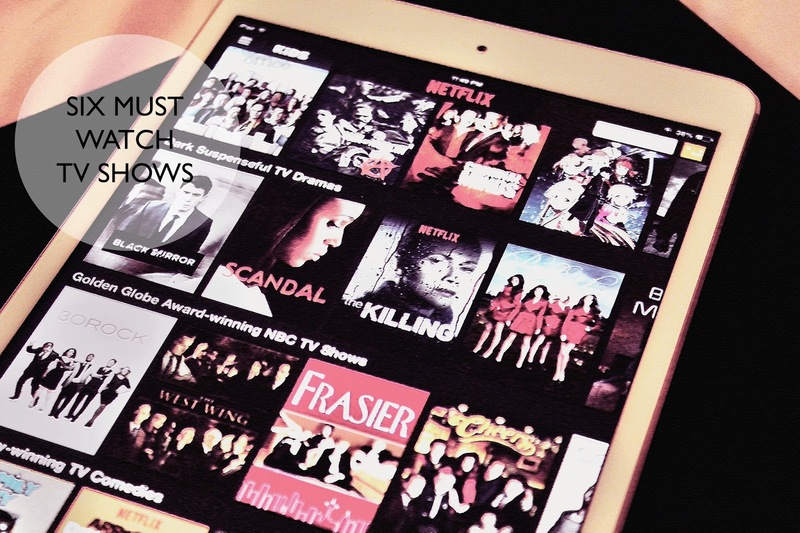 SIX MUST WATCH TV SHOWS! Any TV show buff's out there like myself? There is nothing better than curling up on my sofa with my adorable dog, Zep with some hot tea and just enjoy some awesome TV shows. I thought I would share some with you guys today in case you are on a hunt to check out some new shows! I highly recommend these! Happy Watching! This one is on top of my list because I haven’t heard a lot of people talk about it. The Killing is a murder mystery (on Netflix), which I have been hooked on from the first episode. It is actually partly based on a popular Danish TV series, Forbrydelsen. The series follows the various murder investigations by homicide detectives Sarah Linden and her partner, Stephen Holder. It succeeds in keeping the audience on its toes and if you are someone who likes shows and movies that are filled with mysteries and crime investigations, you will love this! I was on edge during every episode, but it is seriously amazing. Homeland is an American political thriller television series that is probably my favorite show on TV. This is literally the most addictive show if you enjoy thrillers, political shows, and terrorism based genre. The story follows self-destructive CIA agent Carrie Mathison and her work as a CIA agent. It follows various crime and terrorism plots, people and is an overall realistic show. It is filled with suspense and every episode has a cliffhanger that will make you want to watch the show more! Such a must watch! Hey there comic lovers! If you love comics, you will love this show! Gotham is crime show based on characters by the DC Comics in their Batman franchise. The story goes into detail about the city of Gotham and its crimes and includes characters like Bruce Wayne and James Gordon. It is a great watch if you love the Batman comics and even if you are just looking to watch a unique crime show! Each character is extremely unique and makes the show even more interesting. On a lighter and funnier note, I recommend watching Don’t Trust the B---- in Apartment 23! This American sitcom is hilarious. The series follows dorky June Colburn, as she moves from Indiana to New York City to pursue her dream job – until she finds out that it no longer exists, and she ends up moving in with a con-artist party-girl named Chloe. It shows the relationship of two different personalities as roommates and all the drama and fun that comes with it. Unfortunately, the show got cancelled but there are 2 seasons on Netflix if you are looking to watch something light and funny! Another crime thriller (which is my favorite genre of shows), this is a brand new series this season, produced by talented, Shonda Rhimes (who also produced Grey’s Anatomy and Scandal). The show is a legal crime thriller that follows a law professor (Viola Davis) and her students and how they get involved in a murder plot. I got hooked on this show and can't wait till the new season comes out! It’s available on the ABC network. The show isn't what I expected it to be at first but now it's on my list of must watch shows! 6)Scandal: I had to add this show in this list because it is seriously addictive and filled with political drama, love and scandal. It follows Olivia Pope, the owner of a successful Washington, D.C., crisis-management firm, who help people(clients)and their problems go away and bury every secret easily. If you want a bit of everything in a show, check this one out if you haven’t already! I hope you guys find this helpful! If you have any other show recommendations, please leave them in the comments! Do you watch The vampire dairies or Pretty little liars? I love Shameless and Orange is the New Black. Blacklist is also superb. I really like how to get away with murder and I'm sure you will love it if you like Scandal! :) Thanks a lot! I am glad you like it! Hahaha! I will have to check that out on your blog! I love the Killing! Gives me goosebumps! :P Thanks for reading!